Plate measures 7 7/8 x 5 7/8 inches on 14 x 11 inch medium weight wove type paper. C. 1905. Catalog: Novak 33. Edition of 50. This is a rare, very early print of his. Pencil signed and dated in the lower right with the word "Paris." Plate initialed on the left hand side. Rich drypoint burr with extensive use of plate tone. 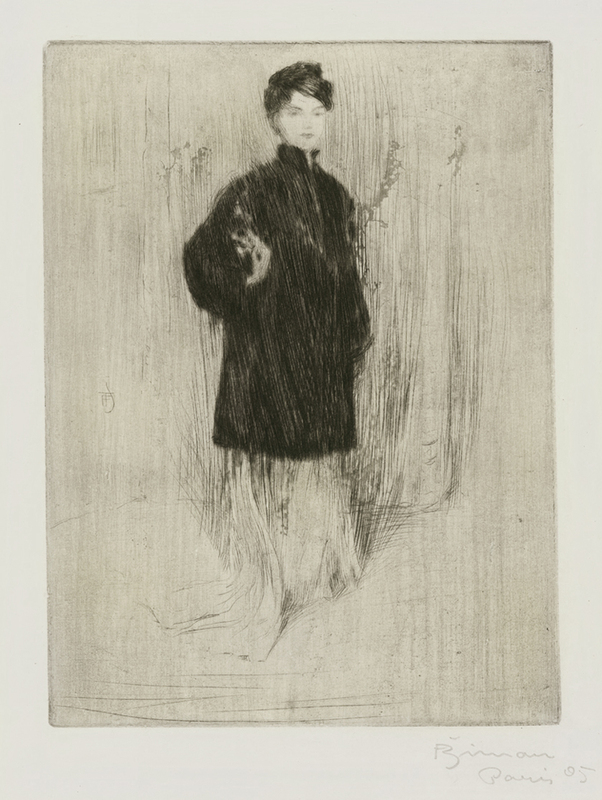 Etching printed on May 6th, 1908. 2nd state. Pencil signed and pellet stamped. Plate signed and dated. 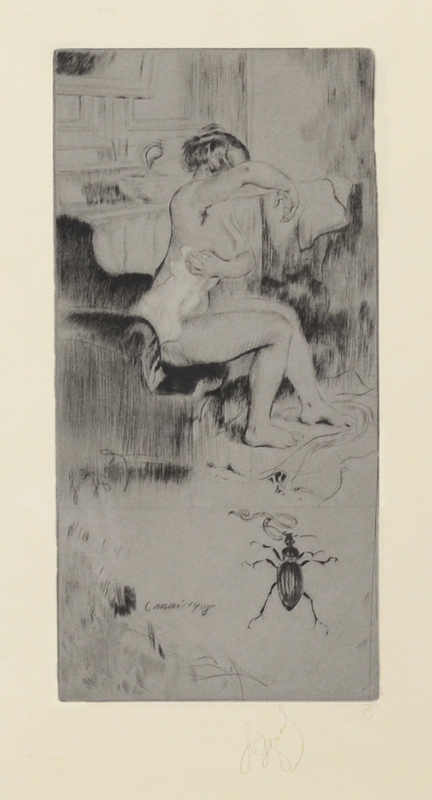 Large remarque of a beetle in the right corner. Image measures 11 1/8 x 5 1/2 inches. Catalog reference: Arwas 353. 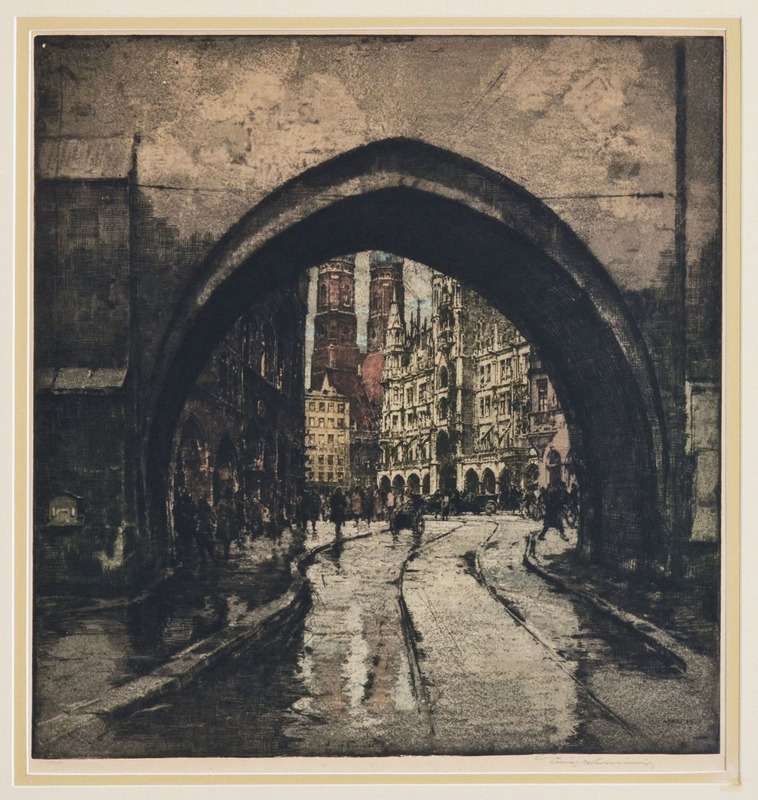 A distinctive original etching and aquatint in colors, image size 19 x 18 inches, 1922, cat: Lorenz- 40, pencil signed. 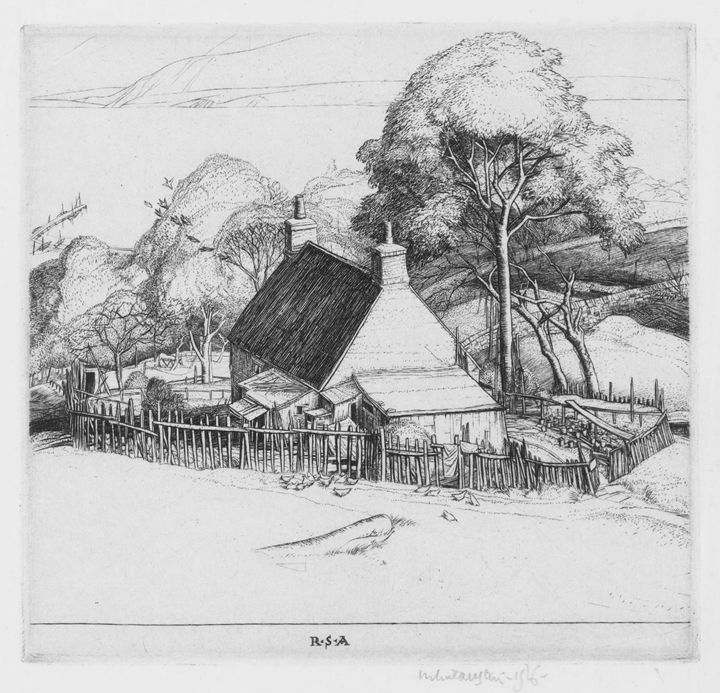 Kasimir studied at the Vienna Academy of Art, although much of his etching technique was self taught and learned through working from nature. He specialized in atmospheric images of architecture, city scenes and landscapes; some bustling with people and automobiles, others quite timeless and serene. Kasimir developed his own technique, which was much more suited to the particular clarity of his compositions. This technique allowed Kasimir to create extraordinarily rich tones and values with clear, crisp lines; he could masterfully bring a scene to life using subtle hues of grays and earth tones accentuated by bright splashes of saturated color. 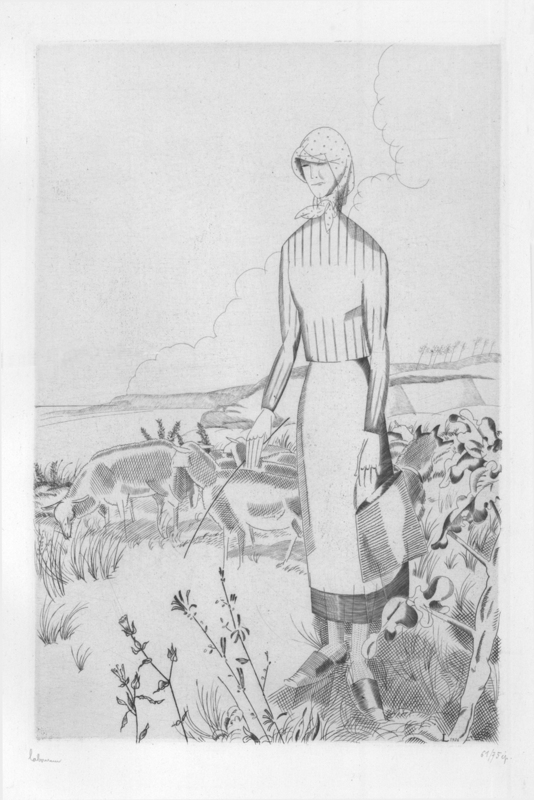 Print 61 in an edition of 75. Signed in the lower left, editioned in the lower right. Plate initialed and dated "1926" in the lower right. Second state. Catalog: Laboureur 323. The image depicts the cliffs along the coast of Penestin, France. Plate measures 9 1/2 x 6 1/4 inches on 15 x 9 5/8 inch watermarked wove type paper. Collector's stamp on back. This print has very fine engraved lines and a very whimsical style. Laboureur studied at the Academie Julian under Auguste Lepere before traveling extensively throughout Germany, Italy and Greece. He returned to Paris in 1910, just when Cubism was being explored, and fully embraced it, incorporating it into his distinct style. He founded the Société des Peintres-Graveurs Indépendants in 1923 and its members included Braque, Dufy, Vlamnick, Laurencin and Segonzac. A beautiful hand colored etching by the British artist, Elyse Ashe Lord. It measures 12 x 16 inches, pencil signed, numbered and framed. Elyse Lord was known for her Asian inspired images using fine drypoint lines and delicate, yet vibrant colors to create images that have a serene, almost dreamlike quality. 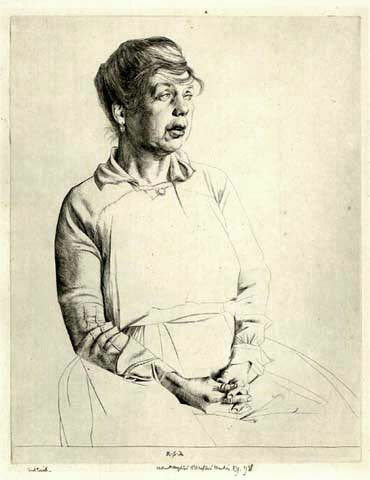 She was a member of the Society of Graver-Printers in Colour and the Royal Institute of Painters in Water Colours and showed her work in many exhibitions including at the Royal Academy, Royal Institute of Painters in Water Colours, Royal Scottish Academy, Walker Art Gallery, Liverpool, and the Paris Salon. 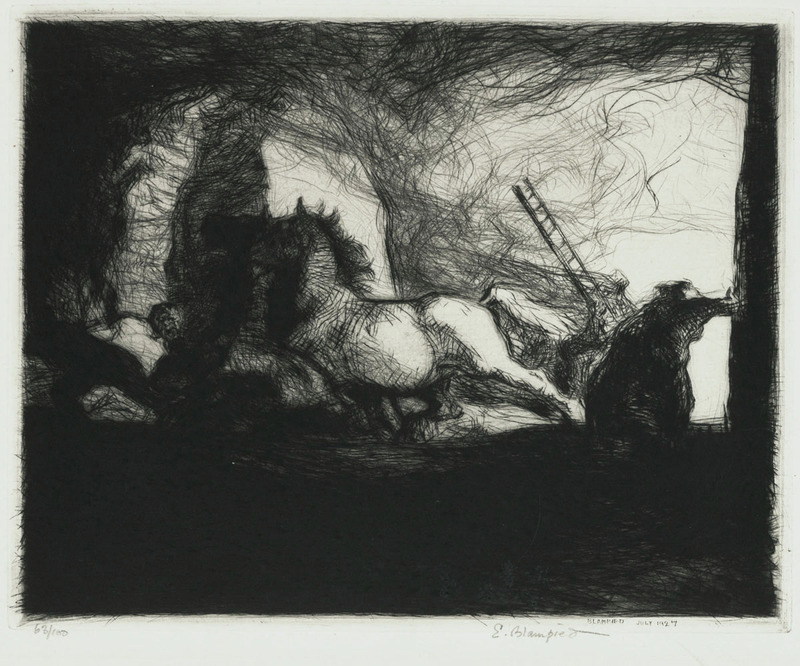 Etching, image size 7 3/4 x 7 1/4 inches, subsequent to Hardie, artist's blindstamp, pencil signed. 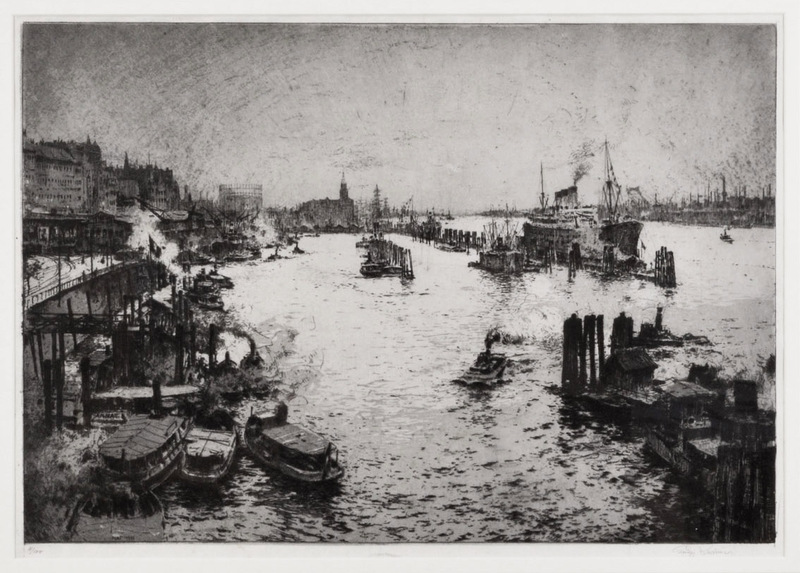 This is a remarkable original etching and aquatint of Hamburg Harbor in Germany. 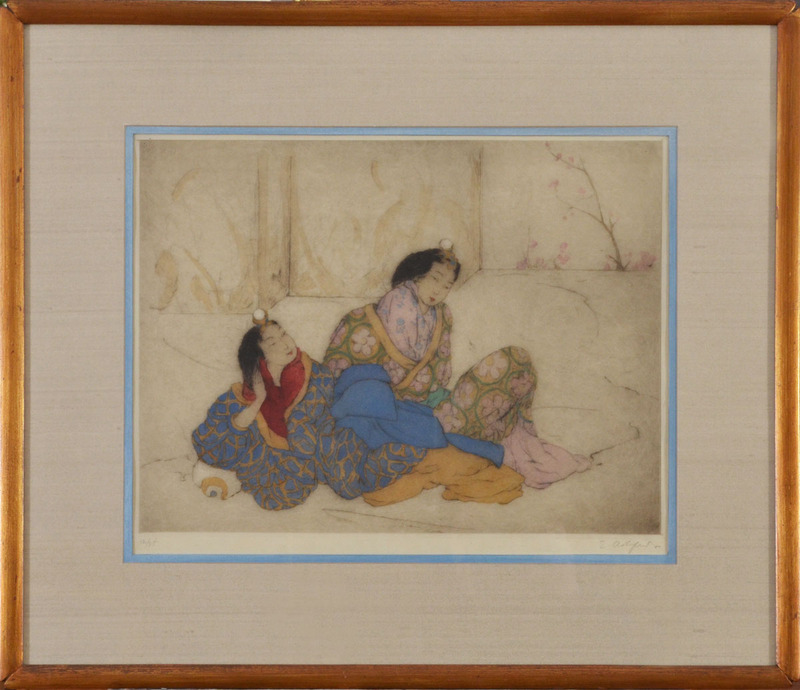 The image size is 15 5/8 x 22 3/4 inches, published in 1914 in an edition of 100 impressions, pencil signed and numbered. This image is printed using two plates, one in black ink and one in gray ink to create a chiaroscuro effect with beautiful tonal range and rich contrast. 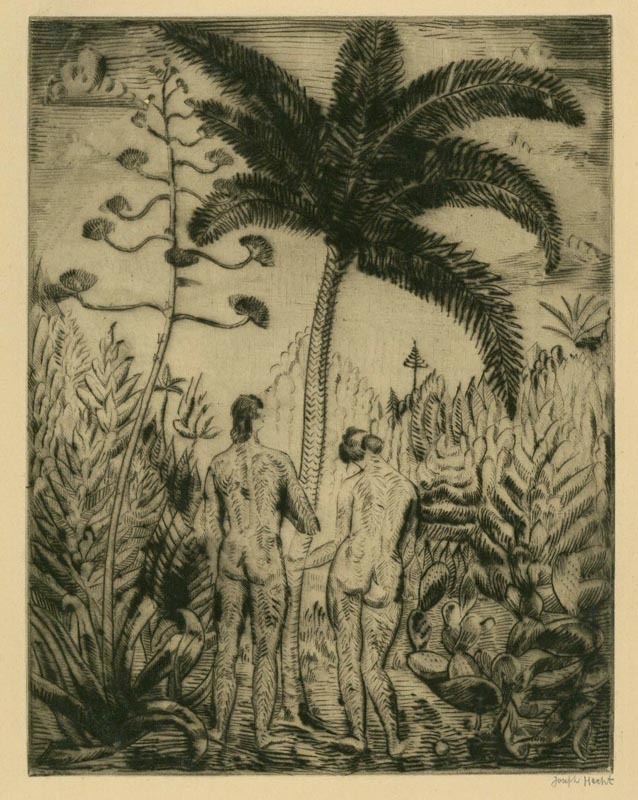 Luigi Kasimir studied at the Vienna Academy of Art, although much of his etching technique was self taught and learned through working from nature. 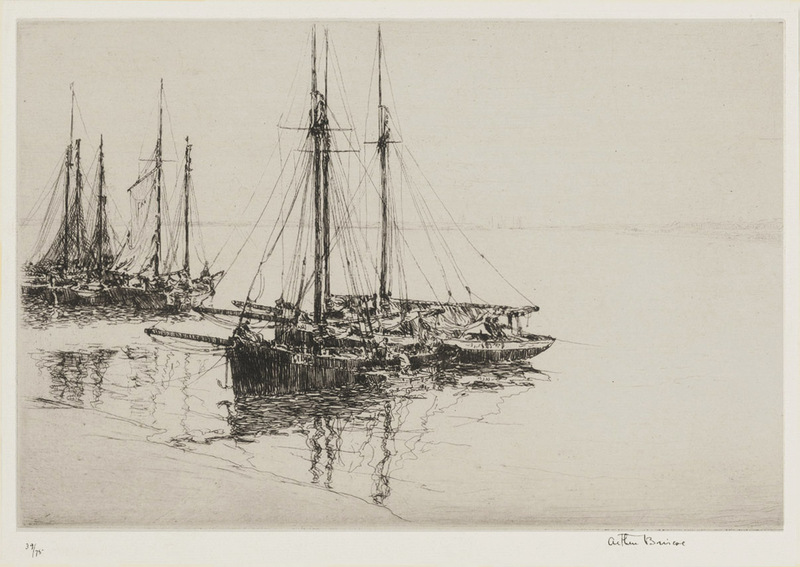 Kasimir traveled all over Europe and the United States creating many spectacular etchings. He specialized in atmospheric images of architecture, city scenes and landscapes; some bustling with people and automobiles, others quite timeless and serene. C. 1926. Edition of 50. Catalog: Dodgson 66. Pencil signed and dated in the lower right. Plate initialed near the bottom. Plate measures 5 1/2 x 5 3/4 inches on 8 1/2 x 11 inch watermarked laid type paper. A charming print with a unique perspective and very fine detail. Catalog reference: Arwas 379. 4th state, printed on velin. Etching, 11 1/4 x 8 5/8 inches, pencil signed lower right. He was involved in the foundation of the famed Atelier 17 studio, an important influence for many artists, including Pablo Picasso, Alberto Giacometti, and Marc Chagall. 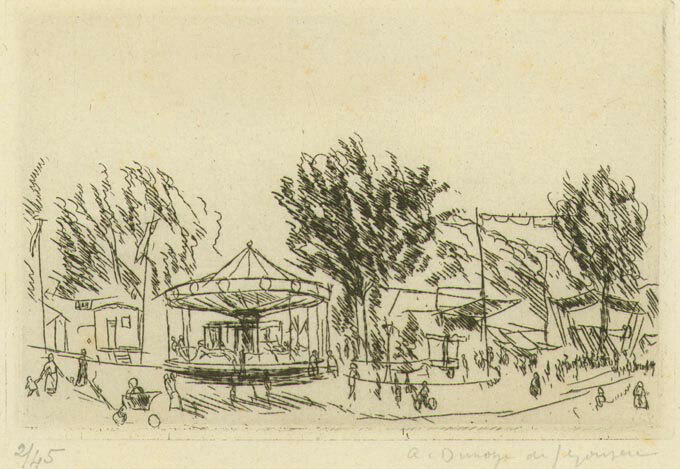 Drypoint etching C. 1927. Plate measures 6 7/8 x 9 on 9 x 12 1/4 inch watermarked David Strang paper. Catalog: Appleby 121. Edition of 100. Illustrated: Fine Prints of the Year, 1927. Numbered 63 out of 100 in the lower left in pencil, pencil signed in the lower right. Plate signed and dated in the lower right. A rich impression with drypoint burr. 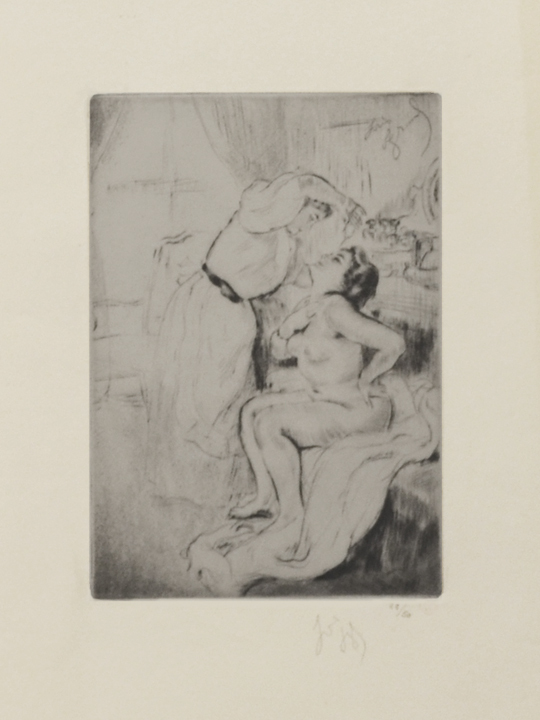 This is an original etching by French artist Auguste Lepere. 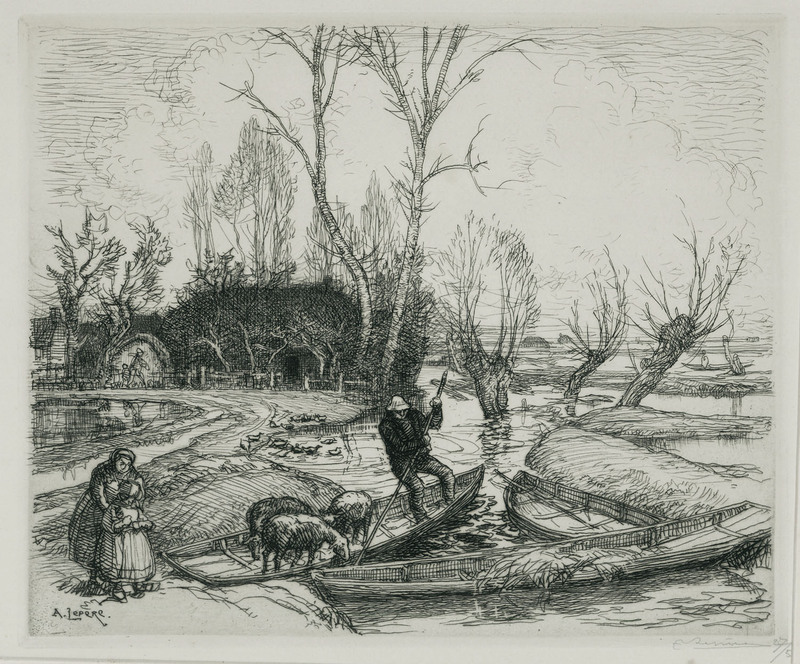 The title of this work is: "Au Marais inode le Berger", In the Deluged Marsh. 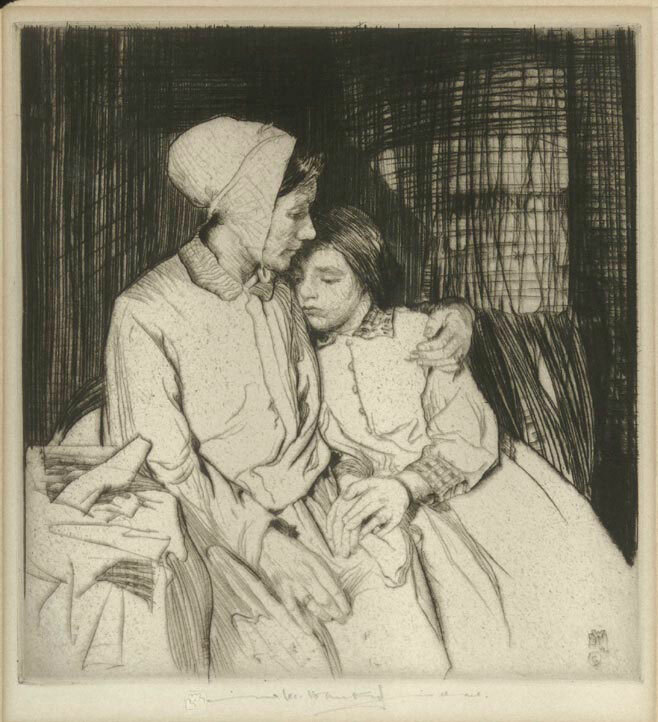 THis etching was created and printed in 1911 in an edition of 50. THis one is numbered as 27/50. The image measures 7 3/4X9 1/2 inches. It was last sold by Keppel in New York and came to us in the original frame with the Keppel label on the back. A very fine example of Lepere at his best, showing the Peasants working in the Marais district of Paris. Engraving, 2nd trial, pencil signed by both Austin and the printer Martin Hardie, image size 13 1/2 x 10 1/4 inches.